The Panagyurishte Gold Treasure is a group of 9 gold vessels from the late 4th/early 3rd century B.C. Thrace that was discovered outside the town of Panagyurishte in the province of Plovdiv, Bulgaria, in 1949. Three brothers, Pavel, Petko and Michail Deikovs, were digging clay for the production of bricks at the nearby Merul tile factory when they found what they thought were funny looking wind instruments. They didn’t even realize the strange “whistles” were made of gold, but they brought them to the mayor’s office where officials called in specialists from the Plovdiv Archeological Museum to examine the artifacts. The “wind instruments” turned out to be gold rhytons, intricately drinking vessels in the shape of a bull’s horn with an open pouring end and a drinking spout at the pointed end, hence the Deikovs brothers’ confusing them for the kinds of horns you blow on. There were 4 rhytons in the set, 2 carved in the shape of rams’ heads, 1 carved in the shape of a deer’s head, the last shaped like the head, torso and front legs of a he-goat. 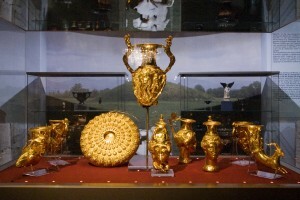 The remaining 5 pieces were 3 decanters in the form of an amazon head, a shallow dish called a phiale decorated with a concentric circle design of African heads and acorns, and a large amphora with fighting centaur handles and carved Greek mythological reliefs, including scenes from Hercules’ life and the Trojan War. The total weight in the set is 6 kg (13.2 lb) of 23-karat gold. The weight of each piece is marked in Greek drachmae and Persian darics. The marks are similar to ones found on Hellenistic gold artifacts from Lampsak, a Hellenic colony on the southern Black Sea in what is today Turkey. Archaeologists think they may have been commissioned from Lampsak goldsmiths by Thracian king Seuthes III. Alternatively, the goldsmiths may have been Hellenic-trained local artisans. Other high quality gold pieces have been found in the area, so the latter explanation has gained more currency lately. Anyway, this is one of the most famous and precious Thracian finds. The Panagyurishte Treasure has traveled the world, most recently last year in Japan. When it’s at home in Bulgaria, it is part of the permanent collection of the National History Museum in Sofia. It’s scheduled to tour the US in 2 months, but between now and then, the Treasure is on display at the Plovdiv Archaeological Museum. It arrived under heavy guard on Friday, and now Plovdiv’s Mayor, Slavcho Atanasov, doesn’t want to let it go. “That’s it, now that it is in, we are not letting it go. We will guard it with human chains,” vowed Atanasov who claims that the treasure found in the town of Panagyurishte, which is technically in the Plovdiv District, belongs to the Plovdiv Museum, and not to the National History Museum in Sofia. Bozhidar Dimitrov, Bulgaria’s current Diaspora Minister and former head of the National History Museum, has slammed the agreement between the national museum and the museum in Plovdiv, under which the people of Plovdiv should be able to enjoy the treasure for 2 months. “I would never give the Panagyurishte Gold Treasure to a regional museum. It is Bulgaria’s greatest asset as far as its cultural heritage is concerned,” Dimitrov said. The agreement, however, has been approved by Bulgaria’s Culture Minister Vezhdi Rashidov, who is in charge of the museums. “Who is the Minister of Culture – Bozhidar Dimitrov or I?” Rashidov has told the media, who also said that in two months the Panagyurishte Gold Treasure is going to be put on display in the USA. Atanasov doesn’t have a problem in principle with the Treasure going on display abroad; he just wants it on his turf whenever it’s in the country. The internecine tug of war could put a spanner in the works, though, since Mayor Atanasov has threatened to give the Sofia museum the copies the Plovdiv museum usually has on display and keep the real thing. The Panagyurishte Gold used to be on display in Plovdiv, but it was removed in 1974 by Sofia authorities because they claimed Plovdiv didn’t have the proper security to keep it safe. Since then the Treasure has been around the world, but this is the first time it’s been back to Plovdiv in 36 years. The Plovdiv Museum has a brand new security system now, more state-of-the-art than the National History Museum’s, says Atanasov, and the gold has remained officially part of the Plovdiv’s Museum inventory all this time, so as far as he’s concerned, the Treasure should stay. My prediction is the Panagyurishte Gold will be winging its way to the US in 2 months and Sofia will get its way in the end, but who knows? Stay tuned for more exciting Bulgarian museum melodrama.